At the end of Part 2 of our interview, which you can read here, Tony had played a vital role in securing the Blades’ return to the top flight. The season was a mixed bag for Tony though. After starting the first three games, including the season opener against Liverpool at Bramall Lane, he missed the next 4 games through injury. He returned to the bench in late September and was back in the first team the following week, but by the start of November he was injured again. The Blades were struggling and their first league victory didn’t come until just before Christmas; a 3-2 home win over Forest. Tony was still missing. He returned in January and was largely ever present until the end of the season which saw the Blades pull of an escape that seemed unlikely at the close of the year. All in all, a disappointing season on a personal level, but a great one for the club. It was a great season that was celebrated by the players in their own way. The post season trip to Magaluf hit the headlines as trouble erupted on the return flight. How come you were sold? You had played a majority of the games that season, you had played at Old Trafford on the Saturday, but you were gone before the much-anticipated Sheffield Derby the following Sunday! 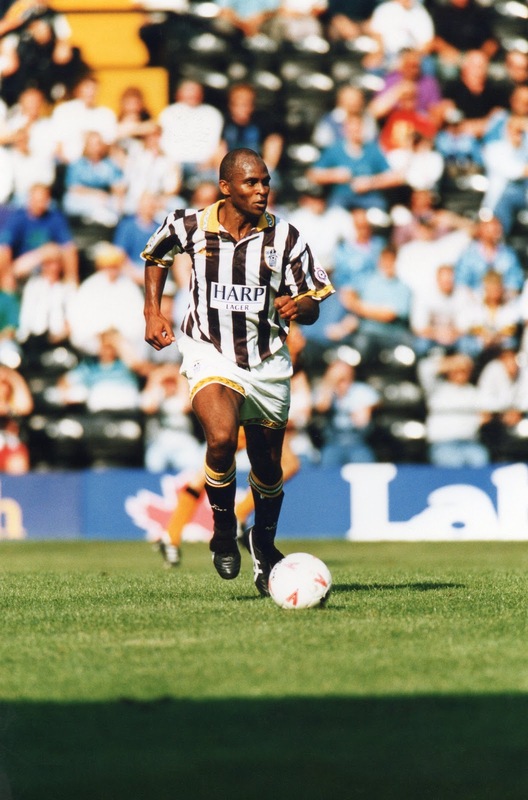 In his autobiography Dave Bassett says that "the club sold Tony Agana" - an interesting choice of words. Did you or Dave have any say in proceedings? "It basically came down to club finances. 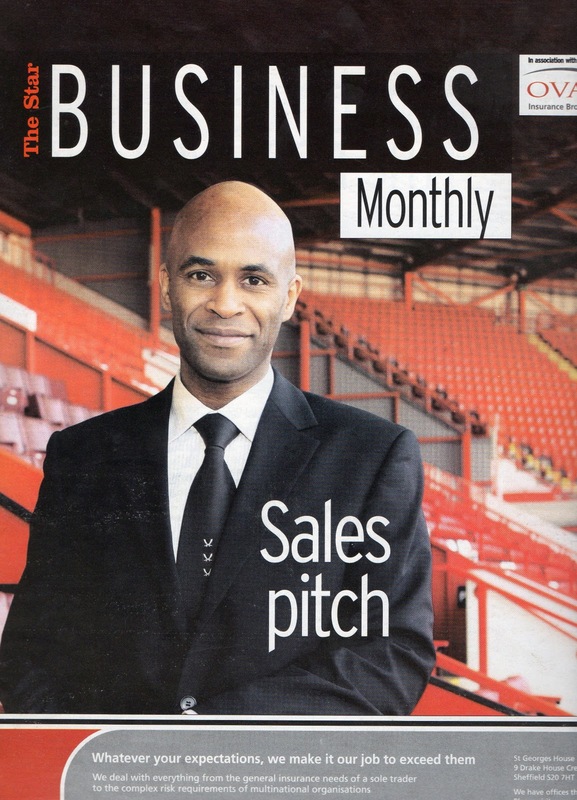 We were told it had to be one of me, Brian (Deane) or Simon Tracey (then Blades goalkeeper) who had to be sold to realise enough cash to balance the books. 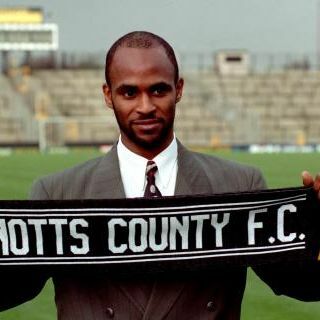 At the end of the day Notts County came in with an acceptable offer and it was me who left. It was less about what I wanted, in those circumstances the club came first. It had to come first. It had to survive. No one is bigger than the club"
You were then (and I believe still are) County's record signing. Did that bring added pressure? "Yes there was an element of pressure, but like at United things were difficult financially and that didn't help. After I joined a number of good players were sold; Paul Rideout, Mark Draper, Tommy Johnson, Chris Short....Money was used to rebuild the ground and not invested back in the squad. The club went through 8 managers whilst I was there. I even had a brief spell as caretaker manager, before Sam Allardyce was appointed. I was unbeaten as well, three draws!" 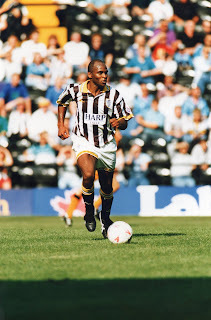 Was it Allardyce’s appointment that signalled the end for you at Meadow Lane? So how did the move to Hereford United arise? Your scoring record picked up at Hereford, but it wasn’t enough to save them that season. What happened after relegation with Hereford? The club had severe financial problems following relegation, which couldn’t have helped. "I was all set to retire, but (the late) Keith Alexander got in touch with me and asked if I would help out a friend of his (Marty Quinn) at Cliftonville in Northern Ireland. It was a short but difficult spell I had there. I would train on my own all week, fly out from Manchester on the Friday and fly back after the match. It was an education as well. One game we played, there was a mini armoured vehicle on the terraces between the two sets of supporters. As an outsider it took a little getting used to." Spells with Leek Town and Guiseley Athletic followed, "I was always willing to help out and do friends favours, and in this case it was Ernie Moss (Leek) and Bobby Davison (Guiseley)". It also led to a brief spell in charge of Leek following Ernie's departure. So was Tony ever interested in staying in the game, in a coaching capacity? "I did take my first coaching badge and passed it. Unfortunately, when the certificate came through they had spelt my name wrong. I took it as a sign! I went to college and then on to graduate with a 2:1 Degree from Sheffield Hallam University and work at the University of Manchester." Tony's life and career took a path away from football, although spells as hospitality host and then in the commercial side at Bramall Lane followed and he made appearances in Masters Football. Today he is working with a couple of local businesses trying to generate new work and contracts for them with other local businesses. The Londoner, who had major doubts about moving to Sheffield 23 years ago, is now settled in Sheffield and doing his best to support and promote local commerce and business. Tony is an extremely positive person to meet. Whilst he admits there have been tough times for him, he displays the positive outlook to life that often comes through in the 140 characters he uses on twitter. This was less of an interview and more of a fun chat about common interests. Playing the tapes back, the over-riding thing that I notice is laughter and the frequency of it throughout our conversation. In the end I couldn’t edit very much out. It was all important in telling Tony’s story and I am sure reading it back that there are many other avenues of conversation and aspects of his career we could have explored. They often say it is not always wise to meet your heroes....that you will only be disappointed. That would never be the case if you ever meet Tony. Thank you to Tony for his time it was much appreciated and enjoyed. Many of the photos used in these posts are from Tony’s own collection and include items found in his Mum’s loft. He started to post a few items and memories on tumblr until the flakiness of tumblr deterred him- hopefully we can encourage him to try again. Really enjoyable read, even for a non-Blade. Great work from both of you.